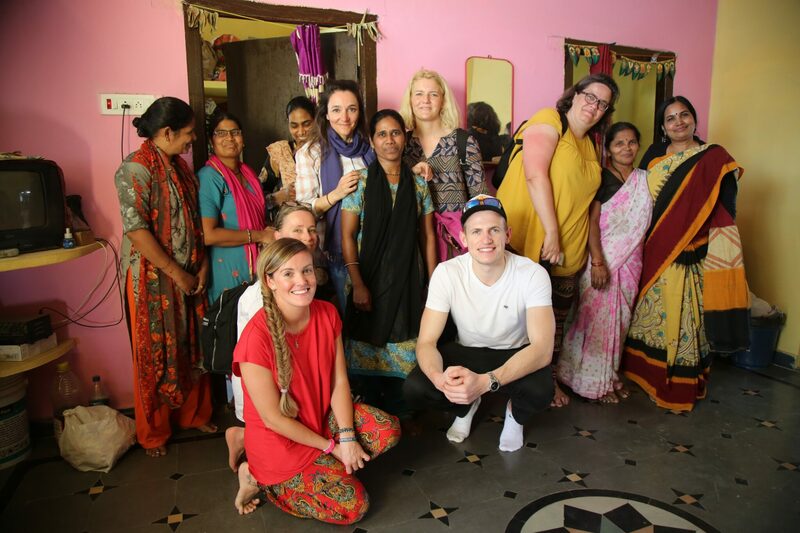 IKEA Germany’s trip to India Written by Gloria Rodriguez. From the very beginning of our IWitness journey, we knew that our visit to Naranyapet was going to be a once-in-a-lifetime experience. Naranyapet is a district located 170 kilometres from Hyderabad and is known for its distinctive handloom sarees (traditional women’s garments from India). We wouldn’t have travelled to a remote village on those bumpy roads had we been ‘normal tourists’ in India – and we knew that what we were about to see, listen to and experience was going to change us forever. When we arrived at Naranyapet, our first stop was the Disha Centre for digital designing and literacy (also known as the CAD unit). As soon as we entered the premises, each one of us was warmly welcomed with a scarf proudly designed and made by Disha women. We could feel the curious eyes looking towards us, and the joy and excitement in the air was contagious. One by one, we were able to talk and interact with some of the women entrepreneurs at the centre. Amongst them, was a soft-spoken but bold Surujuna, who was creating patterns on one of the computers through Computer Aided Designing software. “I can’t even remember how I managed to do all these pre-weaving activities back in the days”, she said. “It took me forever! I’m so happy I can work on my designs on the computer and save a lot of time” she added. I could tell by the look on her face that she was proud of being part of something as big as Disha. She also mentioned that she had never imagined that she would be working alongside so many talented women nor imagined that she would learn computer skills. 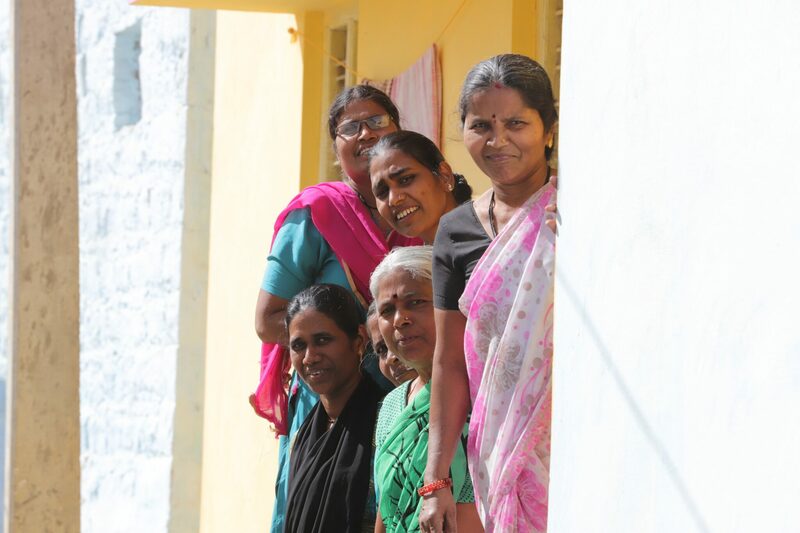 This has enabled her to increase her income and to feel a lot more confident with her business. Surujuna creating patterns using CAD. Photo credits: Deepak Mallik. Before I could even say thanks to Surujuna, I had what felt like a million hands surrounding me. Some of the women had this wonderful idea of asking me to try one of their iconic, self-designed and handmade sarees. At first, I felt a little embarrassed but at the same time, I felt extremely honoured by this gesture. The happiness on their face after they finished dressing me up was priceless. I think it’s safe to say, it was the most precious and unforgettable moment during my IWitness trip. I will carry this memory in my heart forever! Me wearing a saree made by Disha women. Photo credits: Deepak Mallik. Little did we know the day would still be full of surprises and we found ourselves walking towards one of the weaver’s houses. I was delighted to meet a very lively Shayada and a shy Masum. While Shayada’s favourite colour was navy blue, Masum preferred maroon instead. “It’s difficult to pick just one colour,” said Masum. “There are so many, I think I like them all,” replied Shayada. 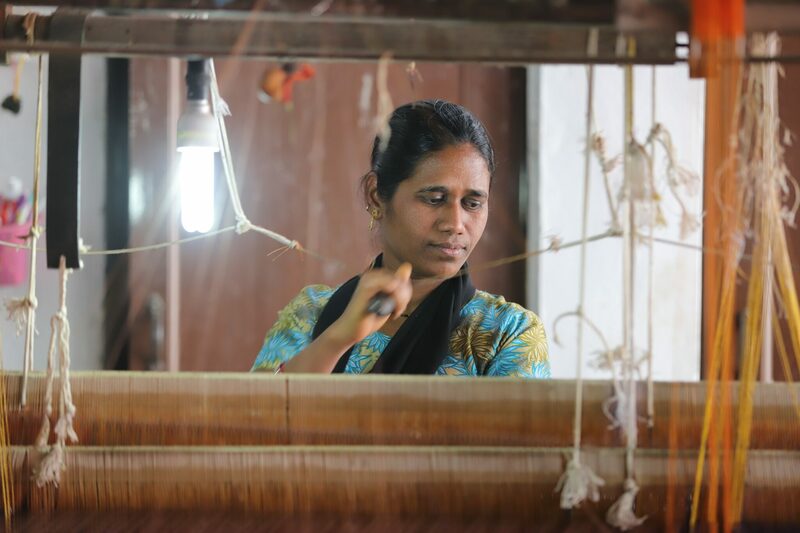 Before their training with Disha, their job was limited to working on handlooms. About six months ago, they heard about training on natural dyeing which aroused their interest. “I remember they (the trainers) told me that I could learn how to ‘paint’ the yarn myself,” Shayada explained enthusiastically. “Someone mentioned that it’s cheaper than buying an already-coloured yarn and good for the environment too,” she added. Both explained to me that all one needs is water, some pots and buckets, a few natural ingredients that can be bought from the local market and, of course, time. To produce some good primary colours, they use onion peel (for red), marigold (for yellow) and indigo plant (for blue). They grind these ingredients, soak them in water for 24 hours, boil and finally, combine them. “If I combine onion peel with a few drops of indigo I get maroon, you see? I can basically make any colour now!” stated Masum. Both left quite an impression on me when they told me how happy they were to learn this new skill through Disha and were looking forward to selling their self-dyed yarn to a lot more customers. Natural dyeing. Photo credits: Deepak Mallik. Weavers taking a break. Photo credits: Deepak Mallik. Right when we thought it was time for us to head back to Hyderabad, another magical moment happened. Each one of us found ourselves actually trying out the handlooms. Though it was fun, it was quite a difficult thing to operate as well. I had the pleasure to be assisted by Fatima, a very sweet handloom weaver, who told me the time it takes to weave the saree I was wearing earlier in the day. “Setting up the handloom with all the threads takes about one day and the weaving alone takes another eight hours,” Fatima explained. “Now sum up the time you need for creating the design, dyeing the yarn and passing the yarn through a spinning wheel. It takes a very long time!” she explained. Her words left me speechless and made me realise how much work, dedication and love are put into handmade products. It was during the long drive back to the hotel, while drinking some delicious water straight from a coconut, that we learned that the handloom sector is the second largest economic activity in India and very crucial for the country’s development. What fascinated me the most from our experience was to realise that handloom is characterised by the employment of many women in India: women who live in rural areas, who have very limited job opportunities in other sectors and who usually exercise this arduous activity besides doing their normal chores like cooking, cleaning and taking care of their families and children. We were so pleased to meet each one of these outstanding and courageous women entrepreneurs. We can only hope that projects like Disha, the private sector and the Indian government continues to invest in and support the handloom and handicraft sectors, which are such wonderful and unique pieces of the amazing Indian culture. IWitness crew together with the weavers. Photo credits: Deepak Mallik. I’m 32 years old and currently work as the Retail Logistics Activity Coordinator for IKEA Germany. Originally I come from Ecuador, but I’ve been living abroad for the past 14 years. When I’m not working you can see me traveling; meeting different people from around the world; reading and doing sports such as dancing, rock-climbing and running. I believe that every human being has the right to an education as well as personal and professional development. I’m really looking forward to seeing how the IKEA Foundation is contributing to that ideal and cannot wait to share my experience with all my co-workers!